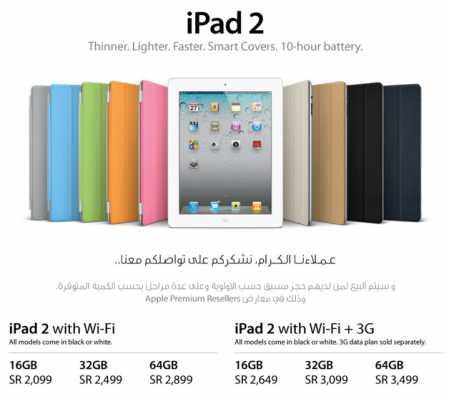 Arab Computers has announced on their website the prices of the iPad 2 in Saudi Arabia. Priority for those who pre-ordered the iPad 2 and stock is limited. 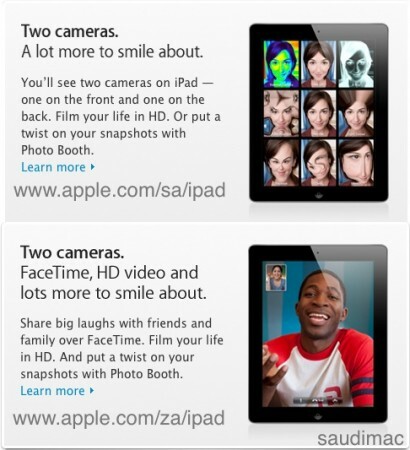 iPad 2 units sold for Saudi Arabia does not have FaceTime enabled which can be confirmed by comparing Apple’s Saudi website with Apple’s South Africa page for example. iPad 2 prices from Arab Computers is similar to Arab Computer’s iPad prices except for the 16GB iPad 2 models. What is odd about the AC’s announcement is listing Jarir “Bookstore”, Jarir is currently selling iPad 2 starting at 2,999SR which is 900SR more expensive than AC’s official prices. If you bought from Jarir at the old price then we recommend demanding a refund.